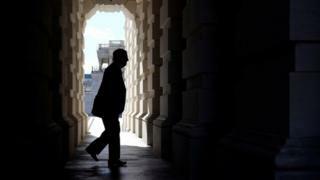 A partial US government shutdown is set to continue through Christmas with no deal in sight to break the impasse over budget spending. The Senate, which must pass a deal, has now adjourned until Thursday. Meanwhile, President Donald Trump will stay on in Washington for the festive period, cancelling holidays in Florida. The shutdown began at midnight on Friday after Democrats resisted Mr Trump's demands for $5bn (£4bn) for his Mexico border wall. Mr Trump warned there could be "a long stay" in the talks and Democrats told him: "You must abandon the wall." Vice-President Mike Pence stressed that negotiators were still talking. Nine of 15 federal departments, including State, Homeland Security, Transportation, Agriculture and Justice began partially shutting down after funding for them lapsed at midnight (05:00GMT Saturday). Hundreds of thousands of federal employees will have to work unpaid or are furloughed, a kind of temporary leave. This is the third time US federal funding has lapsed so far this year, although the other two were brief. What's been happening on Saturday? The Senate held a rare Saturday session but it was not long before it adjourned. Republican majority leader Mitch McConnell said the "pause button" had been pushed and that there would be no new Senate vote until he had a signature from the president - and agreement from the Democrats - on a budget deal. Senate Democratic leader Chuck Schumer said a budget bill that had passed the Republican-controlled House on Thursday approving $5.7bn (£4.5bn) of funding for the wall would "never pass the Senate, not today, not next week, not next year". He added: "So Mr President, if you want to open the government, you must abandon the wall, plain and simple. "The Senate is not interested in swindling American taxpayers for an unnecessary, ineffective and wasteful policy." In a tweet on Saturday, Mr Trump said "we are negotiating with the Democrats on desperately needed border security" but the talks "could be a long stay". He again defended the wall, saying "the crisis of illegal activity at our southern border is real and will not stop until we build a great steel barrier or wall. Let the work begin!" One White House official said the administration hoped the shutdown would last only a few days but it could be longer. Some Republican lawmakers still hope there can be a deal, perhaps involving less money for the wall. On Wednesday, a bilateral deal appeared to have been agreed in the Senate to keep federal agencies open until 8 February. But the agreement did not include funding for the wall. 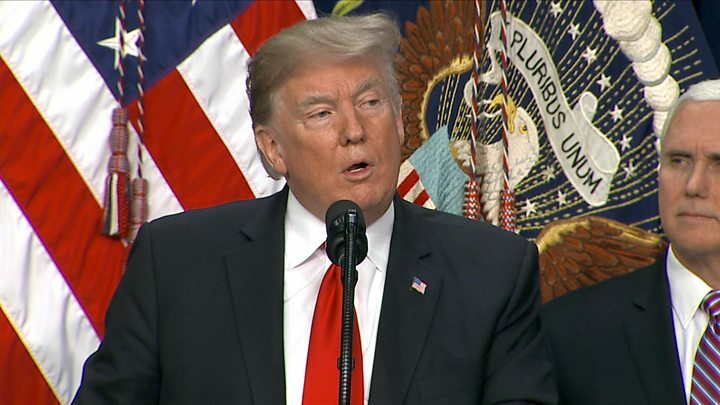 Media captionTrump: "Any measure that funds the government must include border security"
Mr Trump then dug his heels in over the issue after criticism from conservative talk show hosts and other allies, and insisted that funds for the wall must be included for him to sign the budget off. The House then passed a bill with such funding, with Mr Trump well aware the Democrats will be taking control of the legislature in January and wall funding will stall. But Mr Trump does not have the 60 votes in the 100-seat Senate he needs to get the House budget passed. He earlier suggested that Mr McConnell should invoke the so-called "nuclear option" to break the impasse. That would mean the bill could be approved in the Senate with a simple majority. But Mr McConnell has repeatedly refused in the past to invoke such an extreme manoeuvre. What does the shutdown mean? About 380,000 government employees will be made to take temporary, unpaid leave. Meanwhile, 420,000 employees working in essential roles - considered necessary for the "protection of life and property" - will keep working, without being paid. Customs and border staff will keep working, although their pay will be delayed. Airports will continue operating. About 80% of National Parks employees will be sent home, and parks could close - although some may stay open with limited staff and facilities. About 90% of housing department workers will take unpaid leave, which could delay loan processing and approvals. Most of the Internal Revenue Service (IRS) will be sent on unpaid leave, including those who assist taxpayers with queries. The Food and Drug Administration will pause routine inspections but "continue vital activities". The remaining 75% of the federal government is fully funded until September 2019 - so the defence, veterans affairs, labour and education departments are not affected. Martin Ely, 54, a tax officer in Arizona, is affected by the shutdown and says he's frustrated with the politicians. "I would like them not to use us a bargaining chip. "I was last paid a week ago and hopefully should still be paid on 30 December for this week just gone, but anything after that will definitely be affected by the shutdown. "I have been an IRS employee for around nine years, and I was furloughed during the 2013 shutdown that lasted from October 1-17. Being furloughed is never a pleasant experience. Having to live on savings and/or credit while waiting for back pay, which must be approved by Congress, is tremendously stressful. "During the 2013 shutdown, I spent the entire time glued to the TV watching the news and waiting to be called back to work. Many of my co-workers did the same. We can't travel far or plan a vacation during a shutdown because we usually only get a day's notice or less to report back to work. So it's no holiday, especially during the Holidays." Why does Mr Trump want the wall? A strengthened southern border wall was a key election promise from Mr Trump. On Friday he shared a graphic of his steel-slat design for the wall. Later, he posted a video regarding the immigration row, where he said it was "very dangerous out there". His address, which was spliced with footage that appeared to show immigrants pushing down border fencing, cautioned about drugs and violent gang members entering the country illegally. Who is going to pay for the wall? During his campaign he insisted he would make Mexico pay for the wall, but the country has refused. This week Mr Trump's supporters created a crowdfunding page for the building process - an appeal that has so far raised more than $13m (£10m) in just four days.